Frank Hinder was born in Sydney and studied under Datillo Rubbo at the Royal Art Society in 1924, and at East Sydney Technical College 1925-27 with Lyndon Dadswell. In 1927-28 he studied at the School of the Art Institute of Chicago, where he concentrated on drawing. In 1929-30 he studied commercial art at the New York School of Fine and Applied Art and at the Master Institute at Roerich Museum where he had followed two of his teachers at the School of Fine and Applied art, Howard Giles and Emil Bisttram, both committed modernists. He married sculptor Margel Harris in 1930. In 1933 he attended Emil Bisttram's Summer School at Taos, Mexico and taught part-time at the Child-Walker School, Boston 1931-34. The Hinders returned to Sydney in 1934, where they became associated with the Sydney modernists Rah Fizelle, Grace Crowley and Ralph Balson, and later with sculptor Eleanore Lange, with whom Frank organized 'Exhibition 1', the first exhibition of abstract art in Australia. 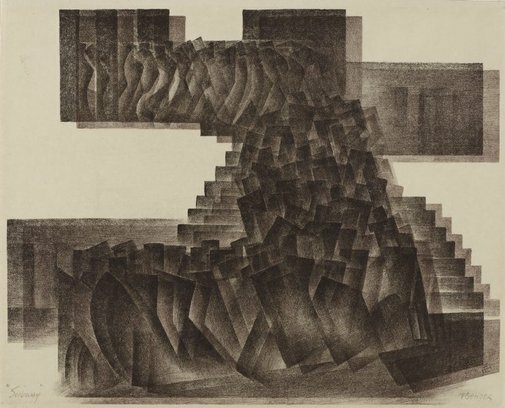 In 1975 he recalled that his interest in lithography was probably aroused as early as 1914, by a special edition of 'The Studio' that featured the work of Daumier and Gavarni; casual encounters with lithographs by Mexican artists Carlos Orozco Romero and Emil Bisttram, the experience of drawing with lithographic crayon while a student in New York. The loan of a book from Robert Emerson Curtis, 'Metal plate lithography', also contributed to his interest. "In 1939, after some searching, I bought a small press (28'' bed), read about Senefelder (who discovered the process), Rex Whistler and others, bought some metal plates and felt I was all set to print lithographs" (Lin Bloomfield, 'Frank Hinder lithographs', North Sydney: Odana Editions, pg. 20). Materials and equipment were hard to find in Sydney, a situation exacerbated by the war - it was not until after the war that he could obtain lithographic stones. He made the majority of his lithographs in the years 1939-61. The subway was a recurring theme in Hinder's work in the years 1929 - 1953, when he was inspired by Wynyard Station in Sydney, and the city's trams and trains. The first proofs of 'Subway' were pulled at the artist's Gordon studio, as a single image (Bloomfield, 55), but in this edition, the image was printed twice, deliberately off-register, once in black and once in brown. Signed with monogram on stone to print twice l.r., black and brown ink "FCH". Signed l.r., pencil "F C HINDER". Not dated.